Gemini’s range of OIP Insulated Instrument Transformers use Oil Impregnated Paper Insulation and are designed for serving in Outdoor applications, with several unique features with one aim – TOTAL RELIABILITY. 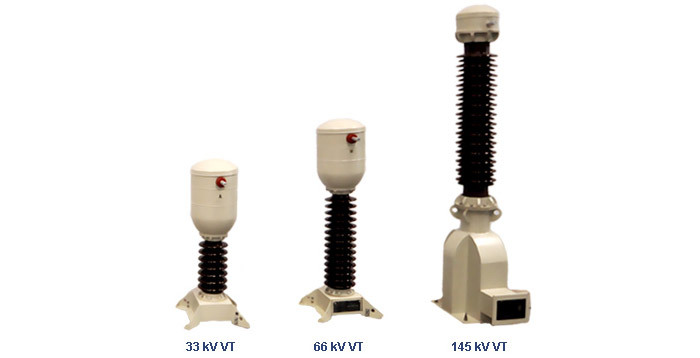 Our present range of OIP Voltage Transformers include VTs from 12 kV to 145 kV as per International Standards (IEC). Gemini’s OIP insulated outdoor products are subjected to extreme climatic conditions at Customer Sites and hence Quality and Reliability have been built into the Product, right from the design stage and are followed up through established manufacturing processes, rigorous In-process Quality checks and the designs validated by exhaustive type testing and satisfactory field performance. Our products are well engineered, our processes are well established. These factors ensure high reliability of our products whilst in service. Our products are truly maintenance-free; hence, only periodical cleaning of the products is required. Our products are designed to be user-friendly - right from unpacking, handling, erection, testing, commissioning and day to day operations in the field. Safety has been built into our products. Even in the unlikely event of an internal failure, the Instrument Transformer DOES NOT SHATTER or explode. A corrugated Stainless Steel Diaphragm has been provided , which, besides lending compensating volume for oil expansions during normal operations, acts as a proven pressure relief device, by peeling off from the tank from the weld and thus averts any explosion of the porcelain insulator. Thin Mild Steel Tank - leads to low Eddy Current in the VT tank and hence low heating even at higher currents during secondary short circuits. Thin Mild Steel Tank - Resilience effect - Absorbs mechanical shocks on primary terminals. Capacitive graded Insulation is provided in the secondary lead out bushing. This ensures uniform voltage distribution and partial discharge free performance ensuring longer life of the product. Crimped joints are provided on secondary leads. This averts loose connections possible in fastened joints. Cemented flanges are used on Porcelain Insulator. This results in uniform mechanical stress distribution on the elastomer gasket - joints and hence minimizes the prospects of any oil leakage. Major Paper insulation is dried in autoclaves, as per proven cycles under controlled vacuum and temperature. The EHV grade transformer oil is degassed and filtered until the desired properties are achieved. Each unit is pneumatically pressure tested at 1 kg/cm2 (gauge) at various assembly stages in order to assure the effectiveness of sealing points. Each Instrument Transformer is pneumatically pressure tested at 1 kg/cm2 (gauge) at various assembly stages in order to assure the effectiveness of sealings provided. After oil flooding, each unit is hydraulically pressurized at 1 kg/cm2 (gauge) and maintained under pressure for 6 hours to ensure complete and homogeneous soaking of paper with oil and also checks effectiveness of sealings. Our products are adequately treated for corrosion resistance. Uniform Insulation thickness with capacitive graded Condenser Bushing is used in all Current and Voltage transformers from 12 kV up to 145 kV Class. All Product designs have been validated by type-tests as per applicable IEC Standards. 3 kV or as per relevant standard. 110V/√3 or 110V/3 or 110V. 1.2 cont./1.9 for 8 hours.